The consumer packaged goods industry, once dominated by established giants, has been transformed by small and nimble entrants like Harry's and Birchbox. These new players have built incredibly successful brands by establishing direct relationships with customers through channels like referral, video, and social media. With an estimated $2 trillion in annual sales, the market for consumer packaged goods is one of the biggest industries in the world. At first glance, there doesn't seem to be a safer market to operate in. After all, human behavior like eating, personal hygiene, and doing laundry will never go obsolete. Even if the world is overrun by VR, people will probably still need basic goods like soap, detergent, razors, and everything in between. But in the past couple of years, we've witnessed an upheaval after upheaval in CPG. Traditionally, CPG has been dominated by large incumbents like Procter and Gamble, who maintain their position by selling high-margin products buoyed by massive budgets for marketing and research and development. Today, companies like Dollar Shave Club, Harry's, and others have triggered an upheaval in the industry—undercutting margins by going directly to the consumer. Instead of spending money on television ads, they leverage viral, cost-efficient marketing channels like referral marketing, video, and social media to organically grow their customer base. By building direct, personal, relationships with their customers, these companies can grow rapidly—while spending very little on customer acquisition. 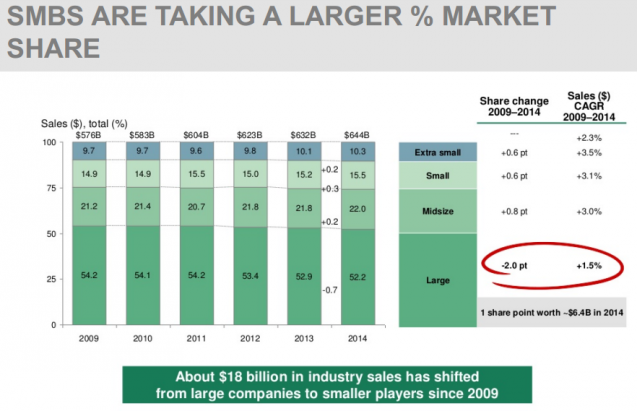 According to a study from CB Insights, CPG disruptors have taken $18 billion dollars of industry sales since 2009. Meanwhile, the market is still heating up. In 2015, over $3.3 billion was invested into over 400 deals in the industry. While first-wave companies like Dollar Shave Club have splashed across headlines with $1B+ exits, we're only beginning to peel back the curtain on the disruption of CPG. In this article, we'll walk through three examples of CPG brands that have successfully built brands by building direct relationships with customers through channels like referral, and provide tips, tricks, and lessons to help you do the same. 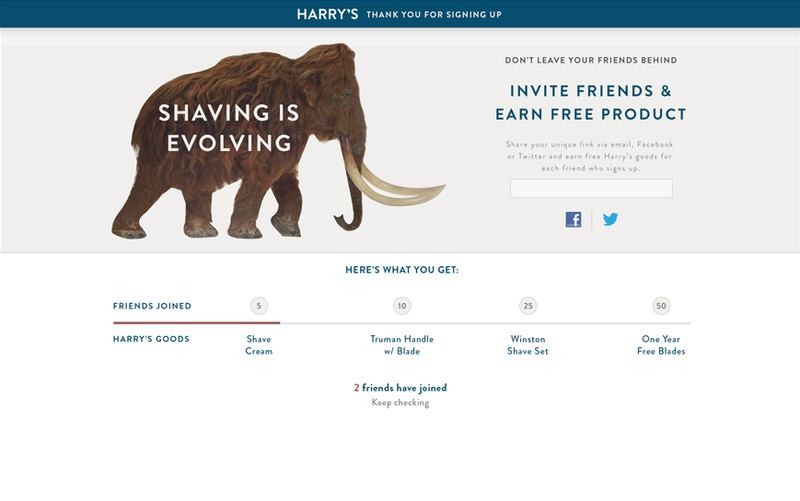 When Harry's was launching its subscription service for shaving products, they were entering a heated market with established players like Gillette on one side, and startup disruptors like Dollar Shave Club on the other. It would have been virtually impossible to grow their brand simply on the strength of their product. Instead of “launching to crickets”, the team decided to use referral marketing to build an early launch list of customer advocates to develop initial traction and on-the-ground support. To build the list, Harry's built a pre-launch website. It explained what Harry's was, and took visitors to a referral page where they could leave their email addresses. Once people had signed up via email, they were assigned a unique URL they could use to invite their friends to sign up for the program as well. To create strong motivation, the program also included various rewards for every user who got between 5 and 50 people to sign up — those reaching the highest level were awarded a free annual subscription for shaving blades. Harry's team were surprised by the success of their own campaign. Using affiliate marketing, they managed to build a list of over 100k emails, allowing them to launch with a bang and raise $100m+ in their first year to buy the German manufacturer of their razor blades. Vita Coco didn't just introduce a new soft drink to the market. It created a new category — coconut water. In a market dominated by the likes of Coca-Cola and Pepsi, making an entry without deep pockets is hard even when you're not trying to hook people on a completely new product. Vita Coco's astonishing success — the brand is expected to reach $1B in sales in 2017 — can be attributed to its strong success with leveraging influencers and celebrity endorsements. Getting the right endorsements and building strong relationships with celebrities are the two factors that led to this success. Vita Coco have strategically selected influencers according to the target demographic they were going after. For example, in the early days when they wanted to get sports enthusiasts to start drinking coconut water, they worked to plant the drink in the locker room of sports teams in Boston and across the US. Once players started digging the drink, the teams started to order it. To establish themselves as a national brand, Vita Coco went after Hollywood celebrities next, getting lifestyle icons like Madonna, Rihanna, and Chrissy Teigen to promote the brand. Rather than paying them to put their face next to a carton of coconut water, the team managed to get them on board as investors. By getting celebrities to pay to be associated with the brand, Vita Coco could put a stronger claim about the quality of its product. Vita Coco understands marketing through influencers so well, that it knew precisely when to stop. When the brand wanted to move away from the premium segment and re-position itself as a drink for mass-market consumption, it dropped the use of celebrity endorsements and opted to promote itself as a way to escape from reality. Birchbox hasn't just picked a digital tactic that works really well, it pioneered the whole model for how managing customers should look for CPG companies in the age of digital. On the surface, Birchbox looks like a subscription company with an attached e-commerce business — customers sign up for a box of health and beauty product samples that gets delivered to them each month. This allows them to test various products before they're ready to buy a full-size package of the products they like, which they can do through Birchbox's site. However, the company has organized its business model around forming and nurturing strong relationships with its audience at each step of their journey to becoming customers. This starts with the troves of content that Birchbox produces and disseminates through its website and social media properties — the brand is very active on Pinterest and YouTube. This allows it to drive traffic and educate users on the products that could be a good fit for them. The subscription box is the “activation” phase of their funnel — it gives them a cheap and easy way to put their foot in the doorway and demonstrate to users the value they can get by using Birchbox. Since the company gets the samples they're putting in the box for free, customers are essentially paying for their acquisition driving the cost down for Birchbox. The brand uses the information it collects from subscribers about their habits and the type of hair and skin they have, to target them with personalized offers. 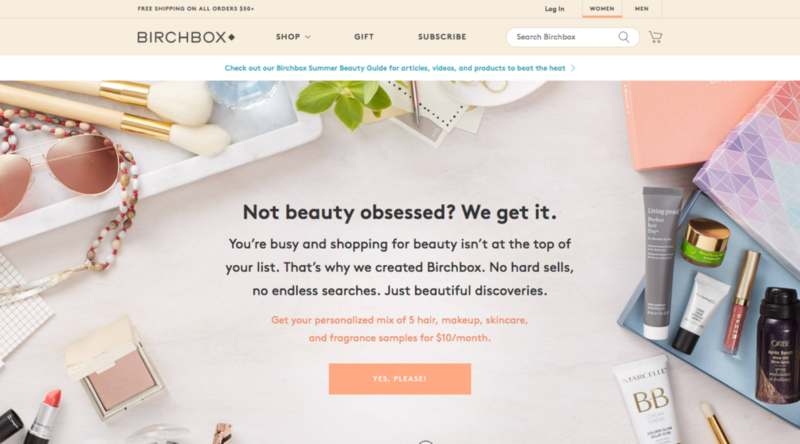 The online shop is the last piece — even though Birchbox has over 1m subscribers paying a monthly fee, around 40% of the brand's revenues come from sales in its online store. This shows the value of building a strong relationship and knowledge of customers, which allows Birchbox to provide very targeted offers to its audience. Finally, Birchbox uses its loyalty program both as a tool to retain customers and turn them into brand ambassadors. Customers get 10% back — rising up to 13% when they've spent at least $300 in a year — and earn extra points when they get a friend to subscribe or buy a subscription as a gift. Although consumer goods is one of the last industries to feel the effect of the digital transformation, it's one where new technologies will have an outsized impact on the future of the industry. Small and nimble entrants are finding ways to move faster than the competition and disrupt established giants by building lasting digital brands that speak directly to the consumer.